After many months, the hype is real and the wait is finally over. It is quite amazing that I managed to restrain myself from watching on the premiere day and it was a mistake. I felt so miserable for the few days as my plan was to watch the movie today with few colleagues. I ran out of patience and today was my second time watching lol. I decided to watch it first yesterday hahaha.. I am so glad that Avengers: Infinity War is not an overhype since it lives to the hype. There are so many surprises which are completely different from what fans have been theorizing and guessing all these few months. While there are homages to the Infinity Gauntlet comic, a lot of things are not identical to the comic which makes the movie still exciting to fans. With so many characters and side stories of what each of them is doing, time is not in their favour. The story is way too big even with splitting the story into 2 movies and the first movie is already running for more than 2.5 hours. The movie still feels too short. With all the hoo hah with Thanos, I am expecting more scenes to show his power and might like how he destroys Xandar and Knowhere to get the Infinity Stones instead of simply showing the 'aftermath'. Similarly the movie opens with Asgardian's ship already in crap instead of showing more action. 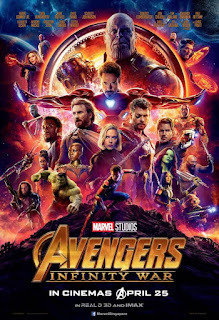 The movie successfully depicts Thanos as an enemy with a 'noble' aim instead of typical antagonists who kill for the sake of killing. The movie could have spent more time giving more back story for Thanos to give him more relatable and understandable personality. The fights are still exciting and the characters interactions are still amusing. However as the movie progresses to introduce more people and stories, it gets more and more choppy and jumpy and that is one thing that I think is not well done. The fight at Titan and at Wakanda can be considered the climax and because of the constant scene jumping, both just lose their climatic feel and the fights do not give the same satisfaction as the previous Avengers movies. A major plot hole is with the relative strengths of the characters. With Thanos so strong and in possession of few Infinity Stones, why would not he simply use their power and kill everyone? Why is he still bothered to entertain fist-to-fist combats? Vision is reduced to some lousy android but hey he owns the Mind Stone, man! In the Age of Ultron movie and in the comics, Vision is one of the more powerful superheroes. Scarlet Witch is another character that suffers from this power scale inconsistency. Remember what she can do in Age of Ultron and if she has the power to destroy the Mind Stone at the same time with resisting Thanos who is already wielding te other 5 Stones, what she is doing in the whole movie is best summarised with what Okoye says: what was she up there (in the lab) all this time (instead of fighting)? I feel that Marvel is good only with war with faceless armies. I expect the Black Order to be formidable enemies worth of treating us great fights with the superheroes. Yet they all get a pathetic CGI deaths (sucked up into space, mangled by a giant wheel machine, destroyed by Wakanda barrier, etc) instead of from a proper and memorable fights with the superheroes. The initial fight at New York and Scotland are actually great so it is a waste that the subsequent fights with the Black Order is not of this greatness. Similarly the tag team vs Thanos at Titan is actually amazing. Yet when he goes to Wakanda, it seems that the movie maker is simply to lazy: let's make each hero run to him one at a time and ground them with some CGI. Seriously there are more superheroes at Wakanda than at Titan, they could have make the battle there more epic. Sorry for nitpicking on the fights so much. This is an action superheroes movie genre overall so the action scenes should be the main offering. I am not saying that the fights are not great but they can be even more epic. I am usually quite a cry baby for movies so it is quite surprising that I did not cry at all despite the so many deaths (I shed tears when Quicksilver is dead at the Age of Ultron). There are a lot of chances to make the deaths more emotional yet they are not explored and built up further. Even the finger snap death has no dramatic effect, except perhaps for Spiderman who is really scared of death and is almost crying to Tony. He is still a teen boy after all. Similar to Harry Potter and the Deathly Hallows which is split to 2 movies, the first half always leaves a hanging and emo feeling. It will be nicer if the ending can give a more anticipatory and "I cannot wait for the sequel" kind of feeling. Nonetheless, this Avengers: Infinity War is already a great and amazing movie (which still got room to be even better but perhaps that is just fans' impossible-to-meet expectations).